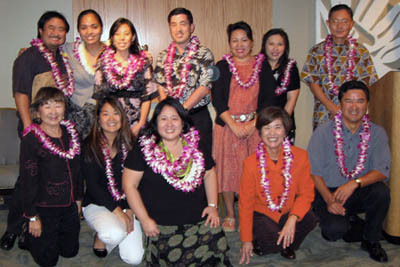 Front Row L-R: Patsy Takaesu, Erin Kobayashi, Valerie Kato, Pamela Tamashiro, and Al Kakazu. Not Pictured: Robert Kamemoto. 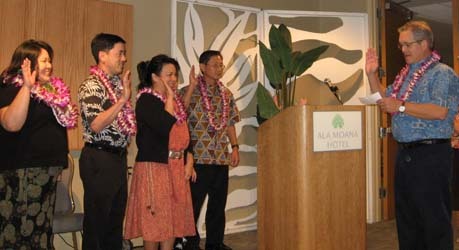 Hui Makaala greeted its new officers and board of directors at the Installation Banquet on January 27. 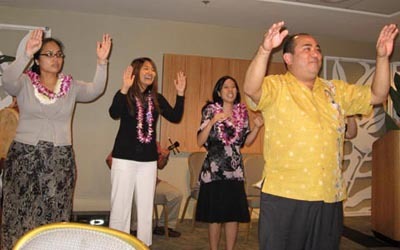 The banquet was coordinated by former President Lisa Shishido, who also served as emcee. 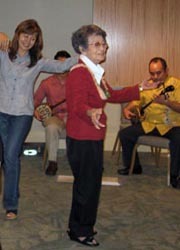 Entertainment was provided by Grant "Sendaa" Murata who also taught the attendees how to kachashi (dance). 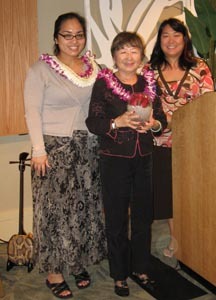 Jennifer Waihee, the outgoing President and Patsy Takaesu (2007 Uchinanchu of the Year) are recognized by emcee Lisa Shishido. while Millie Moriyama proves she is an expert (right).